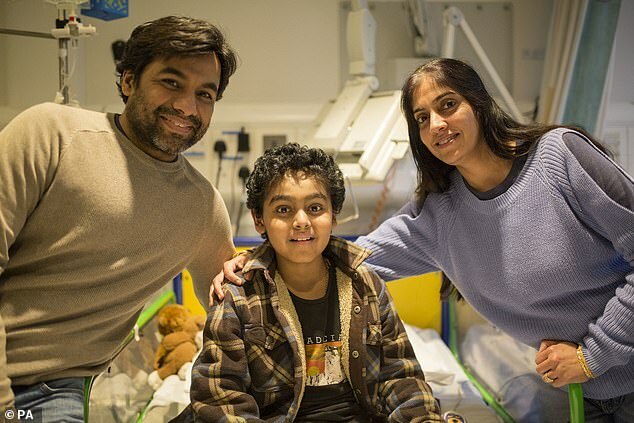 An 11-year-old boy is the first to receive a pioneering cancer therapy that uses the body’s own immune system to fight his leukaemia on the NHS. Yuvan Thakkar, from Watford, was given Kymriah – a type of immunotherapy called CAR-T cell therapy – at Great Ormond Street Hospital last week. The youngster was diagnosed with acute lymphoblastic leukaemia in 2014, which is curable via chemotherapy in around 90 per cent of children sufferers. But after Yuvan’s cancer failed to respond to two rounds of the routine therapy and a bone marrow transplant, CAR-T is his ‘last hope’. Kymriah – also known as tisagenlecleucel – was approved for Yuvan after NHS England struck a deal with Novartis, the pharma giant behind the drug, to offer it at a reduced price. Speaking of when Yuvan was diagnosed, his mother Sapna and father Vinay, said in a statement: ‘It was the most heartbreaking news we had ever received. ‘We tried to stay hopeful as they say leukaemia in children has [a] 90 per cent cure rate, but sadly, his illness relapsed.